Samuel G. Goodrich was an extraordinary fellow on several fronts. 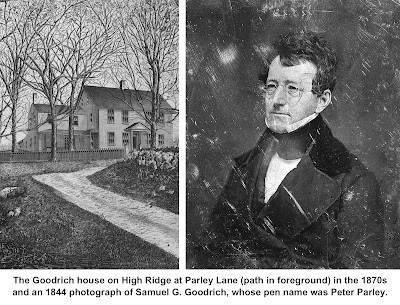 The man who was known to millions in the 19th century as “Peter Parley” provided the nation with a new kind of textbook for its schools, helped introduce the world to one of America’s greatest early authors, and gave Ridgefield a remarkable account of life in the town more than 200 years ago. Samuel Griswold Goodrich was born in 1793 in a house, no longer standing, near the corner of West and Golf Lanes. His father, the Rev. S. G. Goodrich, had moved there in 1789 to become the third minister of the First Congregational Church. When young Samuel was four, his father had a new home built on four acres on High Ridge; the house still stands today at the head of Parley Lane. Samuel spent his childhood there, and left in 1808 to work in a Danbury store and then in Hartford, eventually winding up in the publishing business in Boston. Literally millions of his Peter Parley books—chiefly histories, biographies and geographies—were sold in the 1800s. Some scholars consider Goodrich to be the father of the modern textbook because he made his schoolbooks interesting to children, both in the way they were written and in the way they were illustrated. 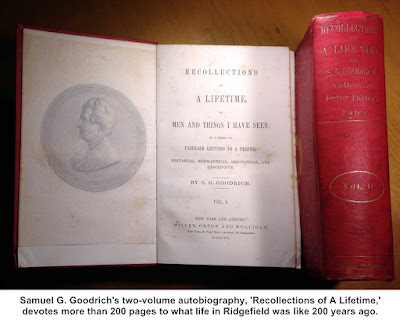 His brother, Charles A. Goodrich, was also an author whose histories were widely used in 19th century schools. Those words appeared in his 1,100-page “Recollections of A Lifetime,” published four years before his death in 1860. This autobiography offers more than 200 pages on what it was like growing up in Ridgefield at the turn of the 19th century and is a unique look at the life and characters in the town then. Few communities in this country are fortunate enough to have as extensive, as literate and as intimate a report on daily life two centuries ago. Pulitzer Prize-winning historian Allan Nevins called Goodrich “Ridgefield’s greatest literary son.” Nevins said Goodrich’s “greatest service to pure literature” was not his books, but his illustrated annual, “The Token,” which he edited from 1828 until 1842. “The Token” published the works of rising authors, including Henry Wadsworth Longfellow, Nathaniel Hawthorne, Edward Everett, John Adams, and Horace Greeley as well as Goodrich himself. Goodrich not only published, but also promoted Hawthorne, writing essays for newspapers that praised his writing and networking on Hawthorne’s behalf in the publishing world. “In 1837, he urged Hawthorne to publish a volume, and helped him find a firm to issue ‘Twice-Told Tales,’ ” Nevins said. “Twice-Told Tales” wound up getting fine reviews, including one from Edgar Allen Poe, who wrote: “The style of Hawthorne is purity itself. His tone is singularly effective—wild, plaintive, thoughtful, and in full accordance with his themes…We look upon him as one of the few men of indisputable genius to whom our country has as yet given birth.” The Grolier Club, the nation’s oldest society for book-lovers, named “Twice-Told Tales” the most influential book of 1837. Hawthorne went on to become famous for such novels as “The Scarlet Letter” and “The House of the Seven Gables” while Goodrich, by his own accounting, published more than 170 books under the name of Peter Parley, many making use of other writers. His last effort, which appeared in 1859, was a 1,400-page, two-volume tome, “The Animal Kingdom Illustrated,” also later called Johnson’s Natural History. Late in life, Goodrich was named U.S. consul in Paris and although millions copies of his books were already in print, he took that opportunity to get some of his titles published in French. He may have been a great literary man but he was also a savvy businessman.